= Plenty of parking exists at the trailhead area, though it will fill up by midday during clear weekends. If it does, park at the campground (only open May 1 – November 30). The trail itself is relatively well marked, though mountain bikers have torn up sections of it, especially in the latter half. = I really like Capitol State Forest because its only about 30 minutes away from me, yet it the state forest itself is rural and largely undeveloped (except for large timber cuts). I give it a rating of three because of its proximity to several municipalities, however I especially appreciate that characteristic about it. Where: Capitol State Forest, Thurston and Grays Harbor counties, Washington. Access the state forest via the Delphi or Waddell Creek entrances on the east side. Take Sherman Valley Road to the C-Line Road. Follow C-Line to the Fall Creek Campground/Trailhead turnoff (also known as C-6000 Road) on the left. Drive down C-6000 to its terminus and park at the Fall Creek Campground or Fall Creek Trailhead. To reach the trailhead, hike back up C-6000 a few hundred feet to the trail start on the right side of the road (just past the creek crossing). When to Go: Little Larch Mtn. is a popular mountain biking trail so try to visit it during less-popular times (i.e. weekdays, early morning or late afternoon on the weekends, rainy or overcast days). Fortunately, the trail is closed to everyone else but hikers and bikers. The summit offers a nice view looking out across the eastern side of the state forest and towards Tumwater, so if you can pick a clear or mostly clear day to hike it. If you visit during hunting season (September through mid-December), wear some bright-orange clothing as Capitol State Forest is a popular hunting destination. 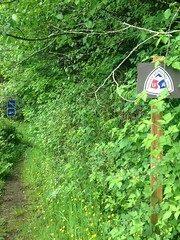 Trail Information: The trail to the summit is roughly 2.5 miles long and follows the C-6000 Road for part of the way. The first half is mostly flat and winds through a clear cut towards the base of the mountain. 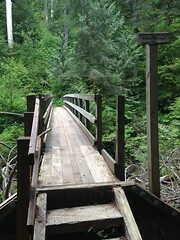 About halfway through, the trail crosses a minor offshoot road of C-6000. The latter half of the trail climbs up Little Larch at a moderate incline. The last quarter follows some switchbacks before crossing another rarely-used logging road and reaching the summit. Towards the top, the trail crosses over some mountain-biking jumps. The clear-cut summit offers a nice view. Some benches and a bulletin board were added to the summit as part of an Eagle Scout project. Tips and Notes: To use Washington State parks and forests, you will need a Discover Pass, which are available for a nominal fee. Washington Department of Natural Resources (DNR) workers check vehicles for these passes, especially during the weekends. 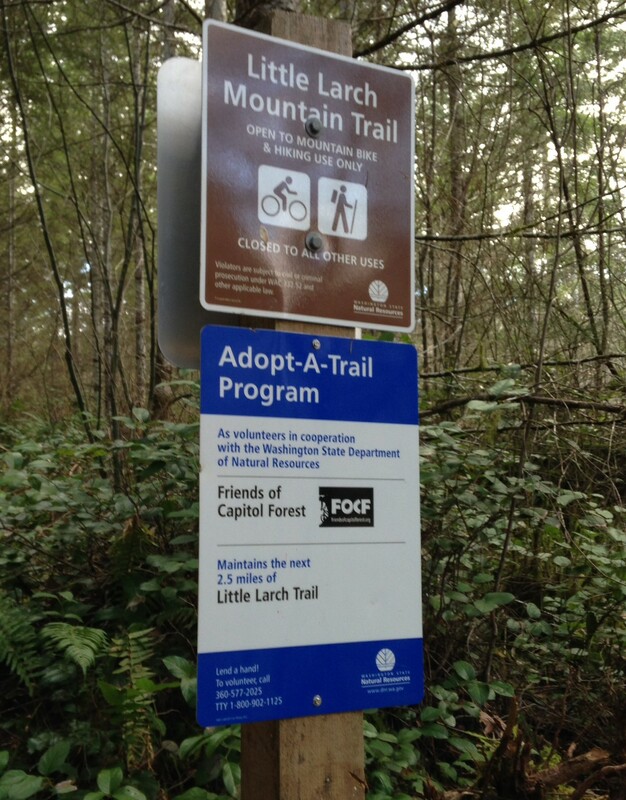 Dogs are allowed at Capitol State Forest (and other Washington DNR properties). According to DNR rules, they must remain on leash. Keep them under voice command if you let them off-leash as the trail does come close to the main road at several points. Also, dress them in orange during hunting season. Planning to check out Little Larch Mountain or Capitol State Forest? Use some of the resources below to plan your next trip. Trail Map: Trail and Road Map of Capitol State Forest. The start of the Little Larch Mountain Trail. 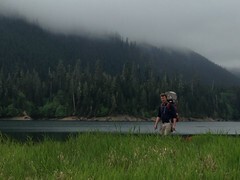 Peakbagger.com report on Little Larch Mt. ← Mima Falls by way of Mima Falls Trail West- Capitol State Forest. Stay tuned for my review.